New Golf Cabriolet – An Icon Returns! It was a sad day in 2002 when the effervescent Volkswagen Golf Cabriolet disappeared from the showrooms. Wolfsburg has still catered for the fresh air enthusiasts in the intervening years with the soft top Beetle and the drop head Eos but diehards, me included, claim there is nothing like a Cabriolet. Since the first was launched back in 1979 it has been a car that has been treasured by probably the widest customer profile, young and old, rich and not so rich, and men and women alike. In the intervening years the motor car world has moved on a pace with the introduction of new technologies to create more fuel efficient and cleaner emitting engines, far greater safety and ever higher standards of production. The first notable sign is the engine line up. 1.2 /1.4 litre petrol engines and 1.6/2.0 turbo diesels. A sage choice rather than an appeal to the sporty minded driver I would suggest though the line-up has strong reputations in other Volkswagen models for both potency, frugality and cleanliness. Importantly, Volkswagen has stayed true to the Golf Cabriolet concept, basing the model on a two-door version of the Golf hatch back and retaining a conventional soft top, albeit triple skinned for greater weather and noise protection and provided with easy to use electric operation. History shows that Volkswagen did its homework years ago when it decided to offer the drophead, placing production with the expertise of the Karmann Ghia factory in Osnabruck, a company famed for creating soft top cars based on mainstream models. So successful was the arrangement that Volkswagen bought the factory. 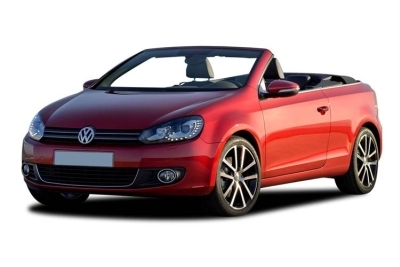 All Golf Cabriolets, including this model, have been sourced from there. I always believe the way to test a soft top car is in bad weather, preferably winter, as that is the real test of the hood’s capabilities. Easy to chop off a metal roof but putting it back with pieces of fabric that can deal successfully with the elements is a real challenge – not to mention maintaining body rigidity. There are three layers of fabric used on this car’s roof, the rear window is glass and has an electric demister and the operation is easy switching with automatic latching and, according to Volkswagen, takes a mere 9.5 seconds. In creating this Cabriolet the designers have also ensured a great deal of practicality by stowing the folded hood in a separate compartment on the top of the boot rather than in the boot area, thus ensuring a boot capacity similar to a hatch back of this size. Admittedly the boot lid is relatively small, as is the load aperture. More load capacity can be achieved by folding one or both rear seats flat. The stowed hood remains visible and looks what it is, a folded piece of canvas material, admittedly good quality but the bonus is that the rear seat space is more or less preserved to a size that justifies the four seat description. Thus, it may not be the most stylistic Cabriolet on the planet but it is functional and that is what Golf Cabriolets are expected to be. Many moons ago Volkswagen showed me a concept diesel-powered Golf Cabriolet at the Geneva Motor Show but it certainly never saw the light of day, probably for image reasons. How times have changed! My test car was powered by a 1.6-litre turbo diesel engine. Admittedly it develops 105 PS or 103.5 bhp and produced a quiet engine note, revved up to about 4,000 rpm in a smooth manner and provided enjoyable rather than totally sporting performance via a positive changing five-speed gearbox. Volkswagen claim a top speed of 117 mph with 62 mph from rest in 12.1 seconds which is more than acceptable for this type/size of car if it is to score with a wide customer base. The real story is a combined fuel consumption figure of a massive 64.2 mpg which meant that the fuel gauge seemed very reluctant to budge for ages. Economy is also aided by the proved Stop+Start system and by Volkswagen’s now familiar BlueMotion energy efficiency treatment. Slip into this worthy representative of the Volkswagen brand and it gives the impression of a quality made product worthy of its price tag (it is zero rated for road tax), the smart fascia layout and interior trim reminiscent of the mainstream Golf, the ergonomically efficient and comfortable driving position inviting one to spend a lot of time driving for the sake of driving. It is an easy driving car, with light positive steering, a good ride with no notable body shake either with roof up or down, smoothly efficient braking, good vision in open top form, not so good with the roof up and sufficiently aerodynamically efficient not to make much mess of one’s hair. It seems a touch noisier than the metal topped Golf but I found listening to the excellent audio or in discussion with my passenger was not a problem even at motorway pace. The standard fit cruise control also proved useful when dealing with speed limitations. Volkswagen build them well and they kit them out well. A few items on the standard menu of this SE specification mode: six airbags, rollover protection system, hill hold function wind deflector, parking sensors, automatic lighting six-speaker audio system with MP3/CD/USB, alloy wheels with SpaceSaver spare wheel, green tinted glass, powered mirrors and windows, multifunction leather covered steering and so much more. If history is repeated with this latest Golf Cabriolet then there will be people lusting after it, attempting to find excuses perhaps to justify owning one. It might be the only car, it might just come as a reward or it might be a retirement car. Without doubt it will be coveted! Rivals include: Audi A3 Cabriolet, Peugeot 308 CC, Renault Megane CC, BMW 1 Series Convertible, Audi A3 Cabriolet. JAGUAR’S C-X16 Concept has been recognised by the readers of What Car? as the vehicle they would most like to see launched in 2012. Despite strong competition, the C-X16 Concept emerged as the clear winner. Adrian Hallmark, Global Brand Director, Jaguar Cars and Ian Callum, Director of Design, accepted the Award for the 'Most Exciting Car to be Launched in 2012' from Chas Hallett, Editor-in-Chief of What Car? Magazine. The C-X16 Concept embodies the innovation and relentless focus on engineering efficiency adopted by Jaguar. Its aluminium chassis structure is lighter than the steel alternative and immensely strong while its hybrid drivetrain allows it to accelerate to 62mph from rest in just 4.4-seconds while returning combined economy of 41mpg.